The most important holiday season in China is the Chinese New Year and Spring Festival. Over 200,000,000 people travel to their ancestry home to be with their families for a long holiday. Schools are dismissed for a month or two. This holiday is based on the lunar calendar and the date changes every year. It falls early this year on January 25th, 2009, the year of the Ox. Airports, train stations, and especially the bus depots are crowded with thousands of travelers wanting to get home to see their families and begin the celebrations. The process of getting there is often quite chaotic; the air filled with people shouting and clamoring, people push for an advantage in spaces so crowded they can hardly breathe. 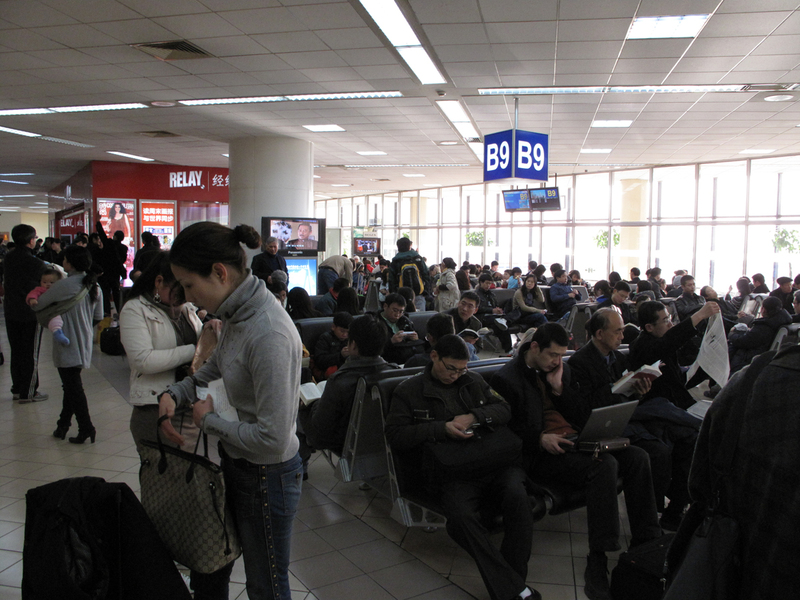 Planes are canceled, trains are held because of the inclement weather, buses are overcrowded and in short supply, tickets are hard to come by and people may wait in line for hours outside in freezing temperatures to try to get one. My originating and connecting flights to my New Year’s destination both were canceled and I had to scramble to find new flights. But, in the end, with bags of gifts in hand the throngs dissipate and somehow find their way home. Once they get there it is a time of relaxing, eating delicious foods, drinking and laughing until the morning light, and watching fireworks explode and sparkle in the cold nighttime sky. It is as thrilling as it is exasperating. A friend of mine in Beijing, Su Ning, director of Platform China Gallery, suggested that if I had the opportunity I should go the countryside as opposed to staying in Beijing for the New Year. She said that is where the traditions are the strongest and I would have an amazing and unique experience. The Chinese people are among the most generous and hospitable people in the world and I was not without numerous invitations, even from incidental acquaintances, to travel to distant parts of China and stay with their fathers, mothers, uncles, aunts, brothers and sisters, together in their home to eat and drink and celebrate with them. A heavy snowstorm in Dongbei (northeast China) postponed my original plans to visit artist, Jia Aili, and his home in Dandong, Liaoning province, which borders North Korea. It is a frigid region in the winter but the New Year decorations and festivities are beautiful and rich, the people are warm, and the foods are delicious. The dumplings are essential New Year’s fare in the northeast and are hand made and served steaming hot. But instead I headed south to Guangzhou, Guangdong. This is very near Hong Kong and I thought since I could not easily get to Dongbei it might be nice to have a few days in a warmer climate visiting a friend’s rural home before I went to Dandong to see Jia Aili. I knew that I was not going to stay in the city but would be going to a town 3 hours northwest of Guangzhou, but what I didn’t know was that it was in the mountains. Huangben village, where He Yuanzhou was born, is a very small and poor village surrounded by gorgeous and strangely formed mountains, the kind you see in ancient Chinese landscape painting but better known along the Li River in Guilin. 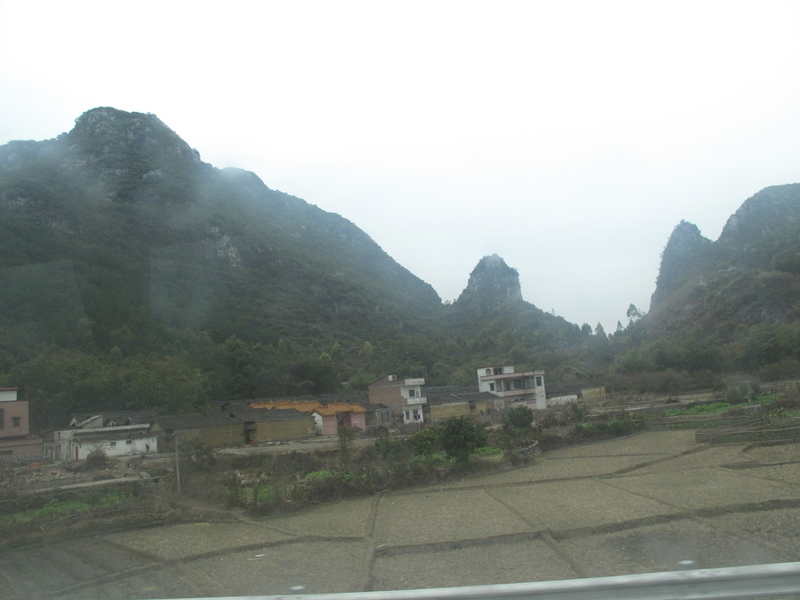 Perhaps the weather abruptly changed when I arrived but when I got there it was not sunny southern China; it was overcast, drizzling, with freezing mountain air. Yuanzhou’s family lived in a large motel style yellow tiled building on the 2nd and 4th floors. It was basically open-air type of living. There was a long open balcony along the front of the building with bedroom doors on one side and the mountain views on the other. The kitchen, living room, and eating area was next to the stairs at the 4th floor landing. Everything is shared within the extended family and I was graciously accepted as one of their own. They are a strong, self-sufficient, and very generous people. I was the first foreigner to ever be in their home and probably one of the few to ever be in their village. Everything they eat they raise themselves; vegetables, fruits, meats, rice, oils, spices, etc. Chickens were kept and raised in an area on the ground floor lobby, the dogs were in the mountains at their old family home, (dog is a favorite dish during the winter months), I do not know where the ducks were raised but one of them woke me up one morning quaking around the house and when I went in for breakfast later there it was, steaming on the breakfast table ready to eat. That is how fresh everything was. 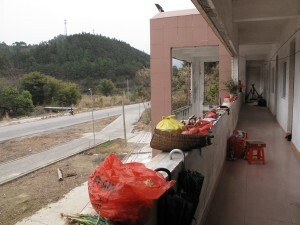 On the first day I arrived my friend walked into the living room area where I was sitting with a live chicken in hand and gave it to his grandmother who killed it, plucked it, dressed it, cooked it with vegetables in a wok on their wood fired stove, then served it to me and everyone else for lunch. When we started eating I reached into the big bowl with my chopsticks and pulled out what I thought was a piece of meat but ended up being the head of the chicken. I turned to Yuanzhou and asked him how to eat it, he said, “Eat everything but the bones.” Then he gave me a puzzled look and stated, “Why did you pick it if you don’t know how to eat it?” Let me just say that it was a happy accident. 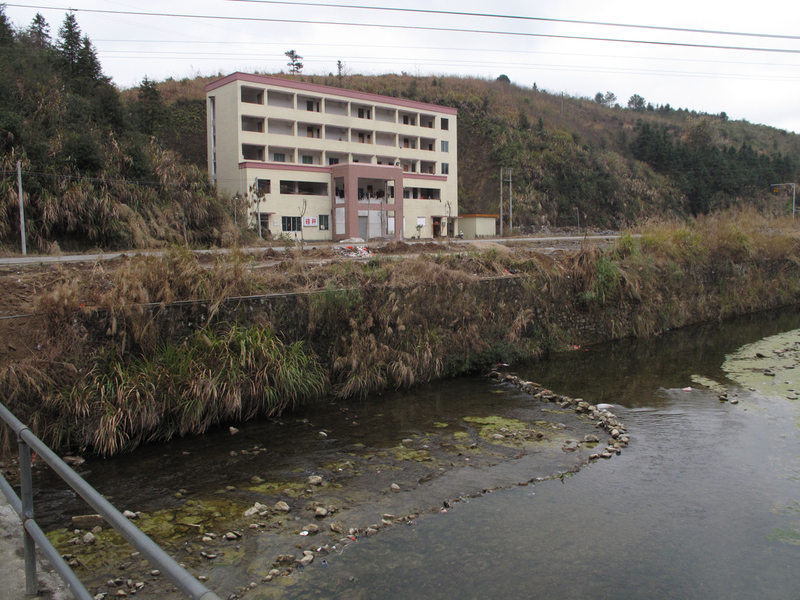 Southern China is usually on the warm to hot side so there are no heating systems in the buildings. One might think it smart to be in the south during the long winter months but actually in the colder north the living spaces are heated, somewhat at least. But in winter the south can actually be uncomfortably cold inside and out. This was the case in Huangben Village. The front wall of my bedroom had a door facing the river and mountains but the transom windows above the door had no glass in them. The back of the room had a doorway, with no door, which lead to a balcony and a squat toilet, both open to the air, and overlooked the hill behind the house. I could see my breath as we toured the room. But Yuanzhou told me not to worry, once I was in bed and covered up it would all be fine. I couldn’t imagine going to sleep in a cold bed at this point but after the first night I never wanted to leave my bed the rest of the day. It was the warmest place in the house. Yuanzhou told me that he was a “mountain boy” and very proud of it. He was the only child or member of his extended family that graduated from high school and was accepted into college. He graduated from university and now has a job in the city of Guangzhou. It is not an easy feat for a rural student to get into university. The competition in China is stiff, there are so many young people trying to get in. The schools in the country are not as sophisticated as the ones in the cities and many rural students end up dropping out of high school early to work in factories or on the farms. I was very moved by his story and by his perseverance and love for his family and heritage. He told me that he never dreamed that this could have happened to him; to graduate in the top of his class and to get a good job in the city, or that he would ever have a “foreigner friend,” and one who would actually come visit his family home. 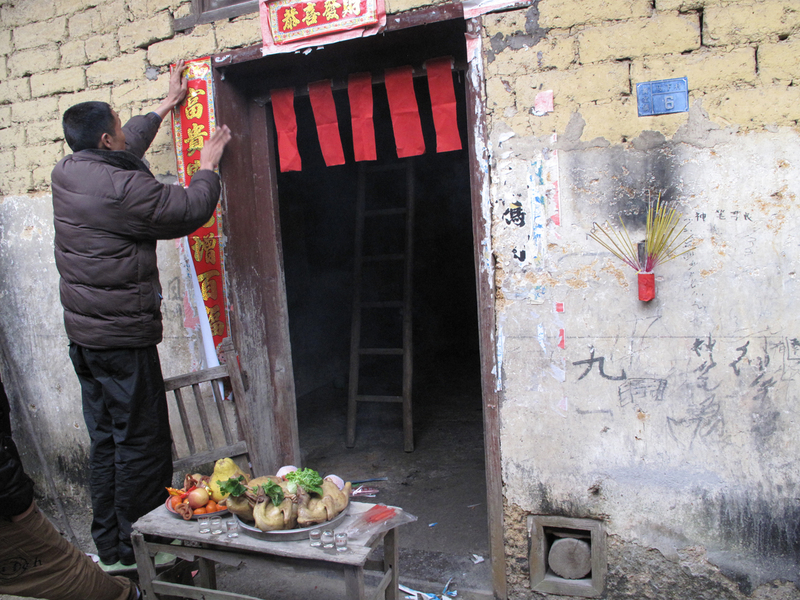 On New Year’s Eve it is the tradition to go to the old ancestral home to pay respects to the ancestors and to provide for them in the afterlife. 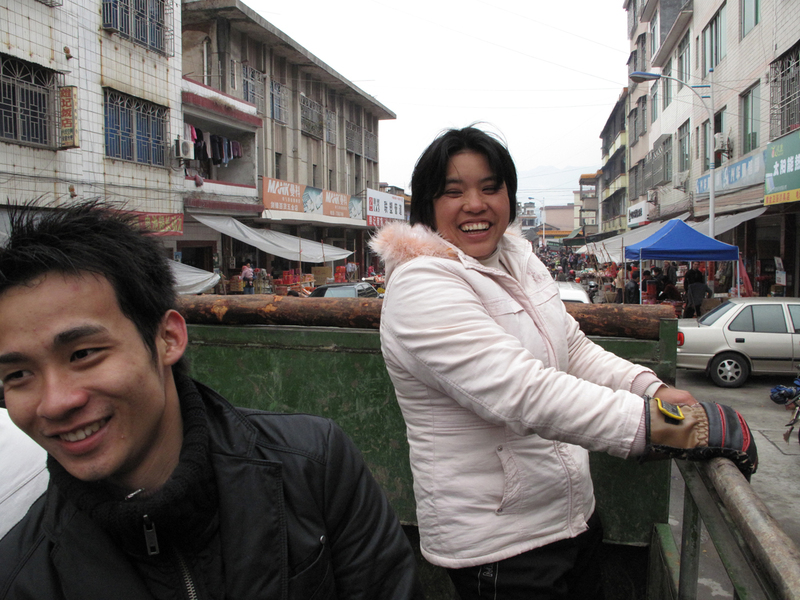 We all climbed into the back of an old green truck and in the freezing morning light headed off to visit the home where Yuanzhou was born. There were chickens, fruit, wine, pork, and tons of fireworks on board for the offerings of the day. My fingers and ears and everything else quickly turned to ice as we bumped and lurched up a winding and treacherous dirt road going higher and higher into the mountains. The scenery was spectacular and our spirits were soaring. Everyone was laughing and carrying on with each other. Their resiliency and joy of life was infectious. After an hour or so we arrived at their isolated home, unloaded the truck, and headed up the hill to the houses. Everyone went about their business getting ready for the ceremonies, which mainly consisted of preparing and arranging the gifts of meat, wine, fruit, and money on a table that would be taken from house to house and set outside the front doors one at a time, dressing the posts and lintels of the doorways with long red papers that wish the house a happy and prosperous new year, lighting incense, and getting the fireworks ready for the celebration. The entry room of each house and the immediate area outside was filled and hung with masses of red paper firecrackers to be lit after they brought the table of offerings to each front door. Once the fuses were fizzling the boys steadily walked away as the young girls ran screaming and the children jumped and laughed; it was a wild, deafening, and joyful experience. Once we were back home and fed, everyone was supposed to bathe and wash off the old year and all of its bad luck and put on fresh new clothes for the New Year. Yuanzhou asked me if I was ready to take a bath. I tried my best to think of any excuse to keep me from having to undress in the cold and get wet, but it was no use. He was persistent and I realized that this was something I had to do and wanted to experience, so I followed him to the 2nd floor and watched him as he heated water in a wok from the wood fired oven for my bath. He took me into the cold tiled bathroom handed me a big red plastic basin and told me how to bathe using a small hand towel, a bucket of scalding water, and the basin. Simple enough, but I still had to take off my warm clothes. 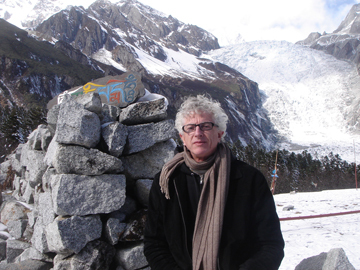 I do not really think of myself as “white” or a “foreigner” but I really must have looked like one at that moment. Fortunately no one could see. Anyway, mission accomplished, but I had to put my old clothes back on because that was all I had that was warm. I hope my luck doesn’t run too bad this year. One of their New Year’s Day traditions is “the opening of the doors.” The act of opening up the doors of the house, like arms opening wide to welcome in the new, is taken very seriously and the right time to do this must be ascertained in advance. Traditions hold that different gods and different demons dominate different hours of the day and can bring good or bad fortune to you depending which one is waiting outside to enter the house. So it is important to know when is the right time to open the doors to welcome the New Year to receive prosperity, health, and happiness and not bad fortune. I do not know exactly how this is figured out but there is an old book, or Huang Li, which is consulted and tells about the myriad of gods and demons and what they represent and the hours and where they will appear. As opposed to New Years Eve, on New Years Day no one bathes and nothing can be cleaned or washed, even the floors are to be left un-swept to ensure that the new good luck will not be swept away and lost for the coming year. The next day, Yuanzhou asked me if I had any clothes to be washed. I followed him down the stairs and out the front door. 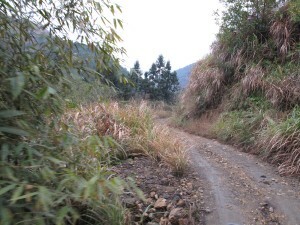 We walked across the road and over a bridge then made our way through a small grove of bamboo down to the river. I watched him as he placed the basin of dirty clothes onto the ground. He then put on a pair of red rubber gloves and knelt down on a concrete slab by the side of the river and began laying out clothing one piece at a time. 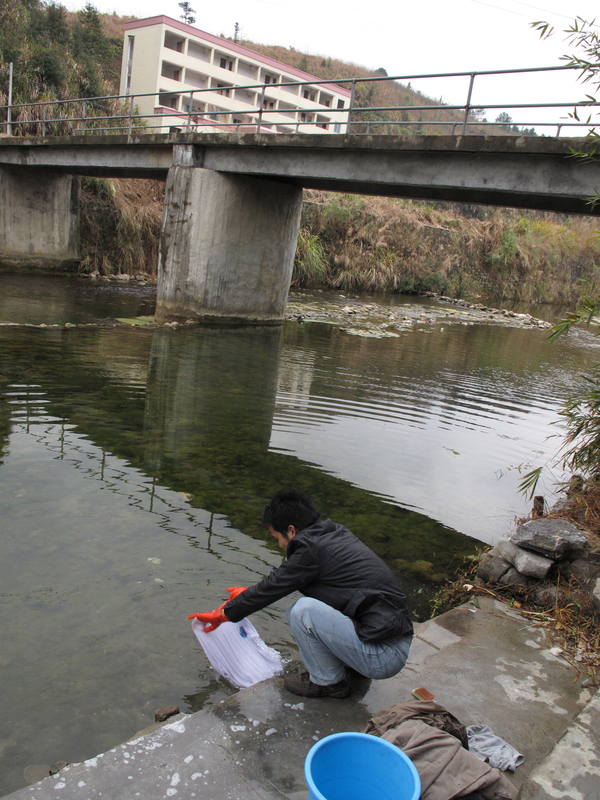 First he dunked the clothing into the river, getting it wet, then put a little soap powder on it before he began scrubbing. He looked up at me and told me that in Guangzhou he had a machine that did this but since his childhood his family had washed their clothes this way and they still do. 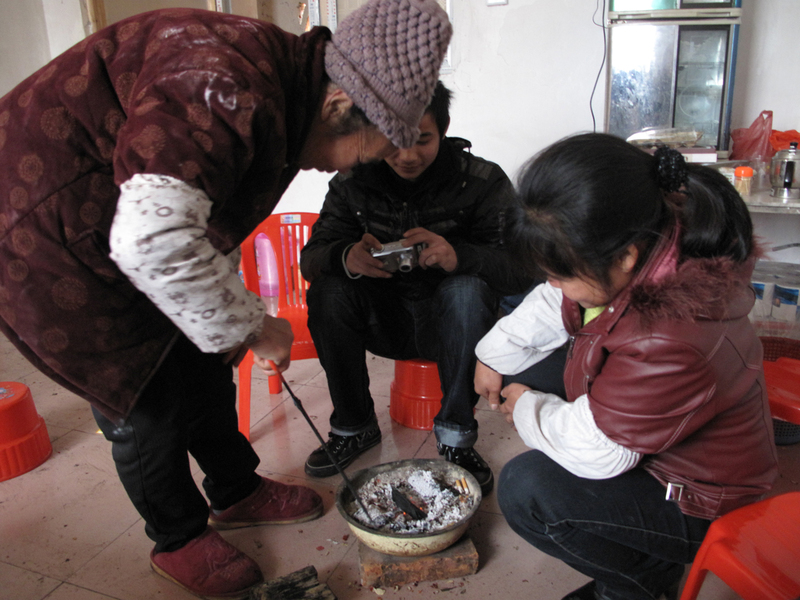 He said his grandmother and mother do not wear gloves but it was so cold that he chose to wear them. He was so at ease as he talked about his life and dreams while rinsing the clothes in the icy river then wringing them out and putting them back into the basin. We could see our breath as we talked. 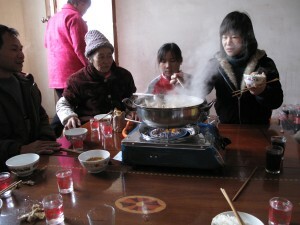 Every region of China celebrates the New Year in its own way honoring its own local traditions, foods, and beliefs. But one overarching unifying theme, at least one readily noticeable to me, was the never ending display, sound, and smell of the fireworks. In the US on New Year’s Eve or July 4th we have an evening of celebration but in China it goes on for days and weeks. When I finally left Huangben Village for Guangzhou and then on to Beijing, I left it to the sounds of firecrackers popping in the air. When I arrived in Beijing the city was ablaze with them. Not just in the afternoon and evening but all day and all night long. It was so amazing. I witnessed every type of firework imaginable round the clock. After two days in Beijing and quickly overcoming a cold I had picked up somewhere along the way, I left again, this time for northeast China to meet up with Jia Aili in Dandong, Liaoning. What I found there were more celebrations, exploding fireworks, swaying red glowing lanterns, masses of red paper strewn in the streets, and the smell of gunpowder and smoke filling the air. I am so sad to see it slowly ending but cannot wait until next year to travel to some new and yet unknown destination for the Chinese New Year and Spring Festival. Run Time: 5 min., 17 sec.